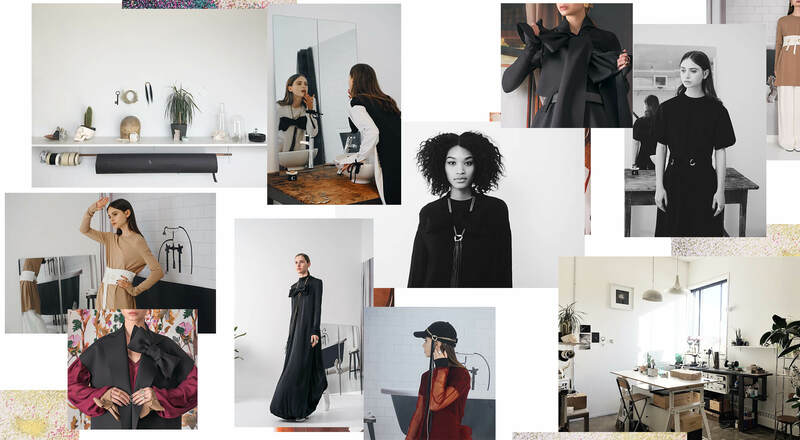 FOR ITS FALL 2018 COLLECTION, MAISON MARIE SAINT PIERRE JOINED FORCES WITH MONTREAL'S LLY ATELIER TO DEVELOP AN EXCLUSIVE LINE OF ACCESSORIES. 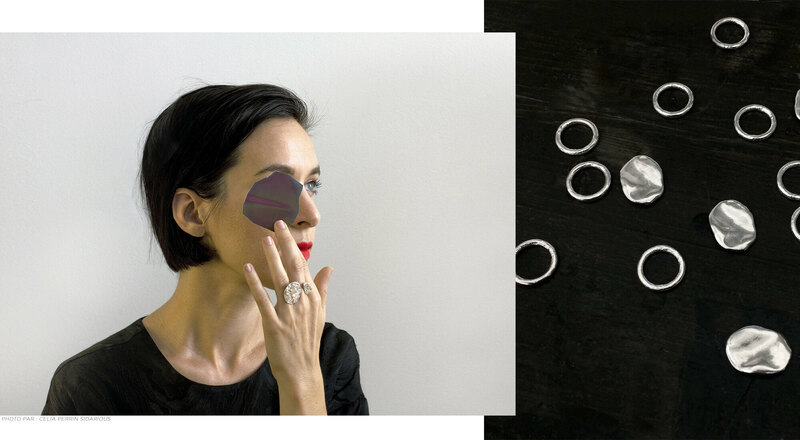 WE MET AGATHE BODINEAU, THE CREATOR OF THIS INDEPENDENT JEWELLERY LINE TO KNOW MORE ABOUT HER APPROACH AND INSPIRATION. THE SELF-TAUGHT ARTIST, HIGHLIGHTS THE CRUCIAL ROLE OF RAW MATERIALS IN HER CREATIONS AND THE VALUE OF CRAFTSMANSHIP RESULTING IN PIECES REFLECTING MINIMALIST AND SOBER AESTHETICS COMBINED WITH ARCHITECTURAL LINES. CAN YOU TELL US MORE ABOUT WHAT INSPIRED YOU TO PUT THE COLLABORATION TOGETHER ? THE WHOLE PROCESS WAS SO NATURAL. I WAS CONTACTED BY MARIE AND SHE TALKED ABOUT HER PROJECT, AND THAT'S HOW IT ALL STARTED. WE BEGAN DEVELOPING A FEW IDEAS TOGETHER FOCUSING AND RINGS AND CURVES. SOON AFTER, THOSE SHAPES AND LINES EVOLVED AND BECAME THE MAIN FOCUS AS WE WANED SOMETHING ORGANIC AND FLUID, NOTHING TO STIFF AND STATIC. CE SONT LE GENRE DE FORMES AVEC LESQUELLES J'AI BEAUCOUP DE PLAISIR À EXPÉRIMENTER. JUST LIKE MARIE, MY INSPIRATIONS ARE VERY ABSTRACT, RATHER THAN BEING REPRESENTATIONS. I'M MUCH INTERESTED AND INSPIRED BY COMPOSITIONS AND SURFACES. WHAT MATERIALS WERE USED IN THIS LINE? THE PIECES ARE POLISHED BRASS MIRROR, MADE IN MONTRÉAL. DURING THE FABRICATION PROCESS, PIECES ARE FIRST SCULPTED IN WAX THEN POURED IN METAL USING A TECHNIQUE CALLED LOST WAX. WE REALLY WANTED TO MIX THE METALLIC ASPECT WITH THE ARCHITECTURAL FORM OF THE CLOTHES, A BEAUTIFUL DUALITY ! BEING BOTH RAW AND POLISHED, THE COLLABORATION PIECES RESULT IN A COMPLEX COMBINATION OF PRECIOUS METALS, FIBRES AND MINERALS. EACH AND EVERYONR OF THEM WERE HAND-CRAFTED AND PUT TOGETHER WITH PASSION FOR NATURE AND UNIQUE MATERIALS WHILE PAYING SPECIAL ATTENTION TO DETAILS. WHAT WOULD BE YOUR FAVORITE LOOK FROM COLLECTION? I FIND THAT THE JUXTAPOSITION OF THE EMBORG BELT TOGETHER WITH CALANDRE VERY INSPIRING. A LOOK WHICH IS MODERN AS WELL AS ARCHITECTURAL AND STRONG BUT BEING ELEGANT AT THE SAME TIME.